The underlying rationale that underpins Radiocarbon Calibration is the assertion that “tree rings” provide “a sequence of securely dated samples”. To produce a curve that can be used to relate calendar years to radiocarbon years, a sequence of securely dated samples is needed which can be tested to determine their radiocarbon age. The study of tree rings led to the first such sequence: tree rings from individual pieces of wood show characteristic sequences of rings that vary in thickness because of environmental factors such as the amount of rainfall in a given year. This primary assertion is built upon a secondary assertion that overlapping “tree-ring sequences” can be bridged to develop tree-ring chronologies that “can be extended far into the past”. These factors affect all trees in an area, so examining tree-ring sequences from old wood allows the identification of overlapping sequences. The assertions underpinning Radiocarbon Calibration date back to [at least] the 1960s. The first such published sequence, based on bristlecone pine tree rings, was created in the 1960s by Wesley Ferguson. Therefore, with the benefit of 20/20 hindsight, it’s possible to perform some simple reality checks that demonstrate the validity [or otherwise] of these assertions. ► Clustering: Especially at the extremes of the 1st millennium. ► Sparse Data: Especially around 950 AD uncalibrated. ► Missing Data: From about 700 AD uncalibrated. Consequently, in 1978, it was suggested to the USA National Science Foundation that it was time to attempt a consensus among the divergent efforts of the many laboratories then involved in calibration research. With this as a goal, a workshop was held in Tucson, Arizona in early 1979, entitled, “Workshop on the Calibration of the Radiocarbon Dating Time Scale” (Damon et al, 1980; Michael and Klein, 1979). This work is largely the implementation of the decisions reached at that meeting. This calibration is based on the 14C activity measurements performed by the radiocarbon laboratories at the Universities of Arizona, Groningen, California at La Jolla, Pennsylvania, and Yale, on 1154 samples of dendrochronologically dated wood, principally Pinus longaeva and Sequoia gigantea (bristlecone pine and giant sequoia). The sparse data problem around 950 AD [uncalibrated] is particularly acute in the Aegean where “tree ring” chronologies struggle to bridge the Heinsohn Horizon. In the United Kingdom the missing data problem around 700 AD [uncalibrated] is particularly acute because “no English tree-ring sequence has been found that spans the fourth century AD”. These issues are deeply embedded in Radiocarbon Calibration but the underlying Delta C14 data from “tree rings” still demonstrates that the data stops around 700 CE [uncalibrated]. Therefore, it appears the assertions underpinning Radiocarbon Calibration are invalid. This conclusion is underlined by the Society for Interdisciplinary Studies which very accurately describes Radiocarbon Calibration as a “hotchpotch of data” that is bundled together into a “model”. It is therefore a general hotchpotch of data and the idea is to tie it all up in one bundle – a classic modelling technique (complicate to obfuscate). The calibration is basically a model. How much faith should be placed in such models as climate models have not proved to be very intuitive of changing weather patterns in the 21st century. Are calibration models another one of the same breed? Are they as unreliable as climate models? And just like commercial software the Radiocarbon Calibration “model” has established an upgrade treadmill of continuous change and planned obsolescence. A good analogy for the Radiocarbon Calibration “model” is Microsoft which first deployed the slogan “Where do you want to go today?” in 1994. “Where do you want to go today?” was the title of Microsoft’s 2nd global image advertising campaign. The broadcast, print and outdoor advertising campaign was launched in November 1994 through the advertising agency Wieden+Kennedy, the firm best known for its work on behalf of Nike, Inc..
Perhaps it’s time to just say no to Radiocarbon Calibration. 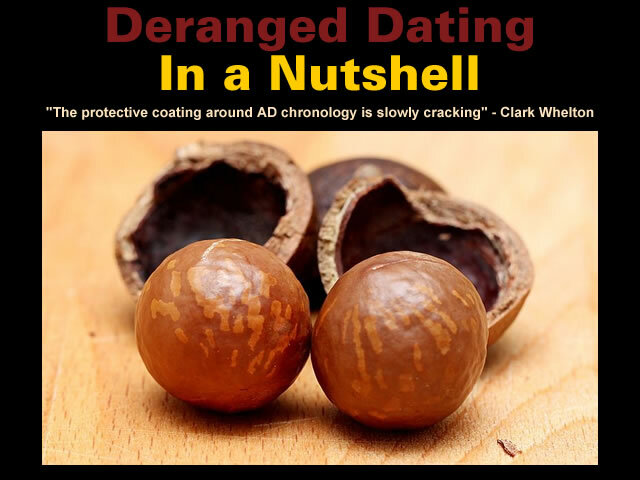 Gallery | This entry was posted in Arabian Horizon, Atmospheric Science, Catastrophism, Dendrochronology, Deranged Dating, Heinsohn Horizon, History, Radiocarbon Dating, Science. Bookmark the permalink. It actually is a carbon 14 climate model, isn’t it? Excellent analogy.